Aimed at serious photographers looking to produce high-quality photo prints, the HP PSC 2175 combines user-friendly and speedier printing with copying and scanning functions in one compact device. 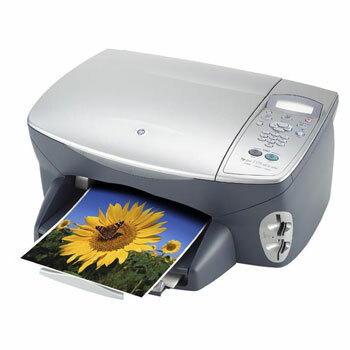 It promises true-to-life and vivid photo output because of its 6-ink colour system and it is well-connected, too, but still needs improvement when printing in best mode and when scanning documents and images. The printer is not exactly the lightest all-in-one device at 17.9 lbs, but it is compact –14.6 inches in diameter, 8.7 inches tall, and 18.2 inches wide. The colour copier and 1200x2400 dpi scanner are conveniently located on top of the printer, beside the control panel. The cover of the flatbed scanner can slide up and accommodate thicker items like magazines and books. The HP PSC 2175 is already integrated with 4 memory card slots for Memory Stick, Smart Media, CompactFlash, and SD cards. The HP PSC 2175 is reasonably priced, easy to set-up, and user-friendly. Users report that the printer does a great job in scanning, copying, and printing. There are memory card slots for direct printing from your camera or mobile device's memory card. The 6-ink cartridge system is optional but ensures more vivid and true-to-life images. You can also optimise the print resolution to 4800 dpi. Scan quality is reported to be unsatisfactory by some users. Installing drivers for the HP PSC 2175 takes a lot of time, too. The maximum monthly of 2,000 impressions is 1,000 less than its predecessors. The standard memory of the HP PSC 2175 is still 8 MB, which may account for its sluggishness.